A paging and intercom system is key to ensuring efficient and effective communication with your employees and customers within your business or organization. Professional design and installation of your system is not the only factor that can help you achieve this goal—creating a maintenance strategy is also crucial to prevent interruptions to your daily work. At State Systems, Inc., we have been helping meet your neighboring businesses’ paging and intercom system needs for years. Our technicians have the experience and expertise to create and maintain the best system and plan for your Mid-South company. We can design and install an intercom or paging system for your business located in Tennessee, Mississippi, or Arkansas. 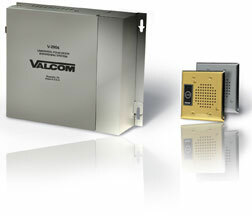 Each company and building requires a uniquely designed paging and intercom system that meets all their communications needs. State Systems has the experience needed to design and install any sort of communications system that you may have—in any size, shape or environment. Our trained staff is happy to provide you with a consultation so we can recommend a well-suited paging and intercom system for your Mid-South building’s needs that fits your budget. To get an estimate on a paging and intercom system, fill out our contact form to your right or call us at 866-308-5701! It’s not too often that your systems will need maintenance. However, like anything else, they can be subject to vandalism, technical malfunction, or simply old age. When these problems occur, call State Systems! Our technicians are fully qualified to service your existing systems and make sure you are not inconvenienced for any extended period of time. If you need paging or intercom system maintenance in the Mid-South, call State Systems today! Our team of technicians is responsive, professional, and manufacturer-trained to service a variety of different paging and intercom systems. We also have access to a full line of parts for any system that falls within State Systems’ wide range of products. All of these things give us a distinct advantage when performing maintenance for your paging and intercom systems. We have designed, installed, and serviced these important systems for facilities of all sizes throughout the Mid-South, and understand what it takes to ensure these critical paging and intercom systems are operating as designed. We can also help ensure your staff is properly trained to maximize system operation. For more information or a quote regarding paging and intercom system services, call State Systems, Inc. today at 866-308-5701 or click here!